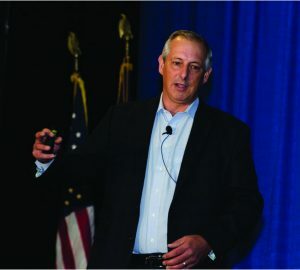 Tony Buettner, project manager with Blue Zones, an organization that helps people live longer, better lives, made an immediate impact on physicians when he revealed practical ways to transform the health of communities and the cultural traits of the longest-lived and healthiest places in the world. Eating more healthful foods is just one secret Buettner shared with nearly 100 physicians who attended the Kentucky Physicians Leadership Academy at the KMA Annual Meeting Sept. 10. People in those “Blue Zones” communities are living to around 90, he said. Buettner cited the Danish Twin study that shows longevity is tied to our genes by only 20 percent. He said 80 percent is determined by our environment and lifestyles. Longevity hotspots, he said, can be found in Okinawa, Japan, Sardinia, Italy, Nicoya, Costa Rica, Icaria, Greece, and among the Seventh-day Adventists in Loma Linda, Calif. The name “Blue Zone” came from the blue circles demographers Gianni Pes and Michel Poulain drew on a map to indicate the cluster of villages in Sardinia’s Nuoro province with the highest longevity. Some of the commonalities that helped people live longer, better lives were exercise, diet, social and spiritual connections, and having strategies to reduce stress, Buettner said. He found that people in these areas don’t necessarily belong to a gym or run marathons. “They move naturally—on average every 20 minutes,” Buettner said. He offered tips on making eating healthier easier. “Chop up fruits and vegetables and put them on the top shelf where they can be easily seen and accessed,” he suggested. People in these Blue Zones also keep parents and loved ones close and make them a priority. They also seek out healthy friendships. Cynthia Rigby, M.D., of Louisville, has been personally impacted by this research. For more information about Blue Zones, visit www.bluezones.com.